As serious problems emerge with the further development of China’s ultra-ambitious New Economic Silk Road, the formally named Belt, Road Initiative (BRI) the Russian Federation, especially in the wake of Washington’s mis-named trade war, is finding a positive role that could serve to change the entire dynamic of East Asian and Eurasian economic development. Depending on how it proceeds, it could help China to make necessary corrections to its current BRI development model and even benefit the development of the United States in a peaceful way. Here are some factors to consider. Since Chinese President Xi Jinping formally proposed his BRI project in Kazakhstan in 2013 the project has undergone a huge advance across many countries from Pakistan to Malaysia to Africa. The original rather vague concept has been greatly expanded with creation of numerous state-tied think tanks in China proposing this or that new element. A major problem, however, has become evident in recent months in several BRI partner countries where China seems to have pursued its own project concepts such as in Malaysia, without due consideration for the needs of the partner country, sometimes leaving them with unpayable debts. The BRI is one of the truly transforming ideas for rebuilding our debt-bloated world economy in a productive way. If that is to happen, it cannot be a mere repeat of the Anglo-American IMF model, “with Chinese characteristics.” Here is where recent initiatives of Russia’s Putin government could provide a major recalibration. The recent ASEAN meeting is instructive in this regard. Until the foolish John Brennan-Joe Biden-instigated CIA coup d’etat in Ukraine in early 2014–designed to split Russia from the EU, most especially from Germany, France and Italy–there was a dominant orientation in Russian policy circles to look West. With the Obama administration strong-arming of the EU to impose economic (self-destructive) sanctions in their trade with Russia, Russia understandably reviewed her options elsewhere. Initially, that has meant opening new economic and political and even military relations with the other giant Eurasian power, China. The results of the cooperation have been impressive in many areas. That said, the danger always lurks that the asymmetry of the relation will make Russia one day overly-dependent on China, and not a sovereign equal. The recent signs of a Putin Asia Pivot also beyond China could be beneficial to all sides. 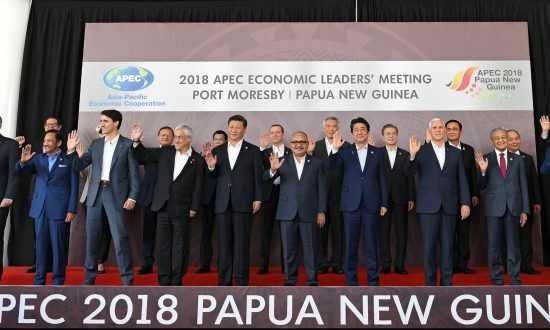 Notably, while Russian Prime Minister Medvedev was sent to the simultaneous APEC meeting in Papua New Guinea where President Xi met with Vice President Pence, Putin chose to attend the ASEAN annual meeting in Singapore November 14 of the ASEAN-Russia Summit. ASEAN members include Vietnam, Malaysia, Indonesia, Singapore, Thailand, The Philippines, Cambodia, Laos, Myanmar, Brunei. On the agenda was discussion of how to deepen contacts and trade between Russia’s Eurasian Economic Union (EAEU) and ASEAN as well as creating what they term a Greater Eurasian Partnership also in the context of the Shanghai Cooperation Organization which includes China, India and Pakistan as well as Russia and Central Asian republics. Russia, owing to its geography and its economy, despite not being the economic or financial colossus China is, is uniquely positioned to be the facilitator of deeper economic and political cooperation across Asia, especially in areas where historical distrust of China is strong. A look at the Eurasian map will show how intimately close Russia is to all these countries. Now Russia is well-situated to leverage that geographical, economic and even military advantage with other Asian partners. The MOU covers agreement on Customs procedures and trade facilitation; sanitary and phytosanitary measures; technical regulations; e-commerce; trade in services and investment; as well as business development. Among projects are agreement for Russia with its advanced IT industry to join with ASEAN in developing “smart cities” along the lines already in process between Moscow and Singapore. Putin also extended a personal invitation to the ASEAN members to be guests at the 2019 Russian St Petersburg Economic Forum and the Vladivostock Eastern Economic Forum. Mutual trade between the ASEAN countries and the Russian-dominated Eurasian Economic Union grew in 2017 by 40% to some $36 billion, still a small fraction of the potential. Negotiations with ASEAN member Vietnam are a significant example of the potentials. Russia has been involved with Vietnam since it discovered the first successful commercial oil offshore Vietnam during the Cold War. In 2015 the EAEU and Vietnam signed a Free Trade Agreement. Bilateral trade grew by 31% between Vietnam and the EAEU (90% Russia) in 2017 to almost $4 billion, and is on a similar further growth path in 2018. Russia’s EAEU countries exported oil, steel, fertilizers, and machinery. Major Vietnamese exports included phone components, electronic devices, computers, apparel, and footwear. Food exports included fruits, vegetables, coffee, cashew nut, and seafood. The treaty calls for the gradual reduction to an average of between 1-2% for import tariffs on both sides by 2025. Now with the MOU between Russia’s EAEU and the ASEAN, Vietnam is positioned to become the supply chain gateway to the other ASEAN countries for Russia and the EAEU. For Vietnam the free trade agreement with the countries of the EAEU opens a market with a combined GDP of $2.2 trillion. They both have targeted US$10-12 billion bilateral trade by 2020, and US$30 billion by 2030. During the ASEAN Summit Putin also held private talks with Malaysian Prime Minister Mahatir who recently scaled back his country’s engagement in the BRI, as well as with Japan’s Abe, Indonesia President Widodo, South Korea’s Moon Jae-in and the Chinese and Thai prime ministers. Notable were his talks with Japan’s Abe on settlement of the long-standing Kuril Islands dispute and with South Korean President Moon on a trilateral resolution with Pyongyang of the Korea issue. Japan, South Korea and Russia are members of ASEAN+8, the East Asia Summit. Abe announced that he is ready to pursue a mutual resolution of the territory dispute that hinders a peace treaty between Russia and Japan since 1945. Several months ago Japan and Russia conducted joint tests to explore development of shipping of Japanese goods to Russia using a sea link and the Trans-Siberian Railway. Russia’s rail transport artery, which is 5,772 miles long, has great development potential for mutual trade between the two nations, according to Japan’s Deputy Minister of State Lands, Infrastructure, Transport and Tourism, Toshihiro Matsumoto. Currently trade is done by sea or air between the two, taking up to 62 days for ocean freight to reach Russia via the Indian Ocean. Air freight is costly. The new corridor would cut transport time significantly and reduce shipping costs as much as 40%. In 2017 Russia and Japan agreed to establish a joint infrastructure development fund, the Russia-Japan Investment Fund between the government-backed investment funds of the two countries to support mutual projects. A resolution of the islands dispute could see that fund expand significantly. What gives Russia a unique window regarding expanding economic and other ties with ASEAN is the fact that now China is under enormous pressure from Washington on its “Made in China 2025” agenda. As well, Japan and South Korea and India seek a balance to over-dependence on either the USA or on China. Russia can represent a highly productive “third way” without forcing a break with China, as Russia uniquely is the bridge connecting all sides. Russia’s recent trade initiatives towards ASEAN, South Korea and Japan assume even more significance in light of Putin’s relations with Indian Prime Minister Modi. In his October meetings in New Delhi, Putin and Modi signed the official agreement for India to purchase Russia’s advanced S-400 Triumf, the world’s most effective surface-to-air missile system, despite threats of sanctions from the US. In their joint press conference Modi declared, “Russia has stood by India through time and has played a crucial role In India’s growth story. With time, the relations between our countries have gone from strength to strength.” The talks also resulted in several agreements in space, nuclear energy and railways. Then nuclear agreement with Russia, currently the world’s largest nuclear power constructor, will include manufacturing of nuclear fuel assemblies in India. And India will acquire 4 Krivak-class frigates from Russia, two of which will be built in India under a $2.5 billion deal. The Putin-Modi meeting was the fifth time the two had met in the past year. They also reaffirmed a strategic partnership, reviving relations going back to the 1950’s between India and Russia. The recent Russian attention to India represents a significant change over the past four years to counter a decline in Russia-India relations and trade as Washington tried to draw India into its sphere. 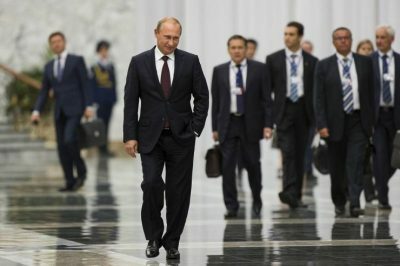 When we look at the recent Asian Pivot of Russia towards not only China, but more recently also ASEAN, both Koreas, Japan and India it is clear that Russia has realized it has a unique potential to emerge as the key to future Asian economic development. It is clear that Putin is making it a state priority to pursue what he announced a year ago at APEC as Russia’s Greater Eurasian Partnership. There he cited Russia’s intention to create an “Energy Super Ring” that unites Russia, China, Japan, and the Republic of Korea, and the Sakhalin-Hokkaido transport link, a proposed road-rail bridge-tunnel that would connect Japan’s northernmost island of Hokkaido with Russia’s Sakhalin. This could only be the beginning of a mutually beneficial regional cooperation.